Earlier this week, Interbrand released their annual ranking of the Top 100 Corporate Brands. Some of the usual international exports (Coca Cola, McDonalds, Disney) and a huge number of tech giants (IBM, Microsoft, Google, GE, Apple, Intel) dominate the top 10. It’s pretty interesting, and, if you’re like me and interested in understanding how people perceive brands, how a brand becomes so incredibly valuable ($71 billion, really?) then the methodology section is the first place you stop. Now, I don’t have an MBA, but I do have a planning degree which pretty much means I’ve studied similar concepts but in real estate, and, their method makes sense. Basically, you take the profit the organization earns (economic profit), multiply by some estimate of how many consumers bought the brand’s product when they otherwise would not have, then discount it with the brand strength. Ok, great. Essentially, now, you have a monetary estimate of how much value that brand adds to its company, a quantitative measure of the impact of the brand. Which is useful for comparing brands; but does it really capture which brands are most memorable, which ones have the most aficionados, what brands people are talking about daily? Not exactly. This is the challenge of measuring brands–what is the value of having a million or a billion people who love your brand, if they are not buying? If Apple’s dynamic role in the tech industry and Steve Jobs’ inspirational style did not drive millions of iPhones and iPads to fly off the shelves every time they hit stores, would there be any point to building the design-centric brand that Apple has built? As a relatively new concept, brand managers and marketing folks have had to prove their value in monetary terms, and thus, the focus has been overwhelmingly on ROI (return on investment). I think that is not enough. Like many things in our capitalist society, brand value has been given over to the financial return it can generate. Having a powerful brand, having a great marketing campaign, having an extremely successful viral video–it’s only as powerful as the return it can generate. When I did an examination of brand power for places, however, I found this to be an extremely problematic way of measuring brands. As Simon Anholt has frequently said of nations and of cities, it is incredibly hard to measure the impact that a brand can have. Likewise, cities, states, and nations cannot have nearly as much control as Coca Cola or McDonalds or Apple can have over the messages they generate–after all, most of what we know about cities comes from images that the local government has little to do with, things like TV shows (Real Housewives, much?) and the photos our friends post on Facebook. For a city, brand management is less about selling a product (tourist stays, e.g.) but more about controlling the popular image your city generates so that natural processes, like educated residents moving in or businesses moving their headquarters to infill land, can continue without second-guesses and indecisiveness. So what have cities done to uphold their brands? 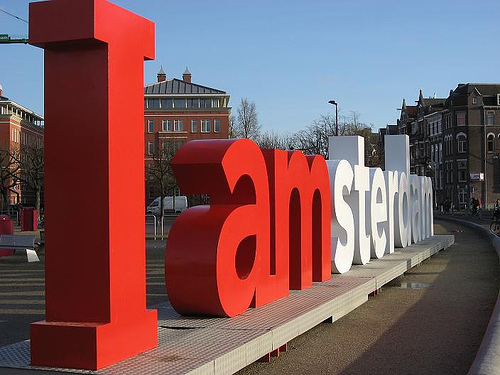 Well, some famous examples are out there: New York is well known for its I ♥ NY campaign, and more recently Amsterdam installed big red letters for its iamsterdam campaign. Those are kind of cute and have a great effect. But really, brand management for cities is more about managing the tourist experience. In 2007, for example, Paris’ Mayor, Bertrand Delanoe, asked Parisians to try politeness for a day. Surprisingly, ads for the campaign were widely successful, and Paris has seen its rankings on the politeness listings crawl up. The visitor experience in cities that rely on tourism can be critical. Of course, it doesn’t hurt that Paris is already the most visited destination in Europe, and its representation in film, television, pop culture and the arts is second to none. Ultimately, I think for brands–whether they be for places or for cities–we need to think less about the ROI that a branding campaign can generate, and more about engaging with consumers, visitors, and the public. Social media and increased access to the internet and mobile phones are making this easier than ever, and inbound marketing is the buzzword of the day. For cities, corporations and anything or anyone with a popular image, consumers today expect authentic engagement and a deep understanding of what the brand stands for, and what it means. To say “New York is a place for the arts,” for example, is no longer enough. New York is a place for the arts because the city government, its population, and the world at large support arts, theater, film, and so many other forms of expression. That came far before anyone ever tried to brand New York as a place for the arts. This entry was posted in branding, built environment and tagged brand management, branding, cities, marketing, place branding. Bookmark the permalink.